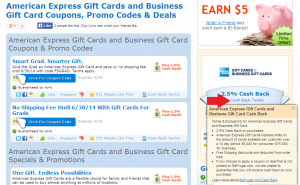 After the end of promotion for Father’s Day (there was a code to waive a purchase fee through June 16th 2014), a rate of online shopping portal for American Express Gift Card is down on most portals. The highest rate had been 4% cash back from Lucky Rewards, and the rate is now significantly lowered to 1%. Fuel Rewards Network had been 2x, which was equivalent to 4% cash back, and it is now 1x (equivalent to 2%). As of June 20th, the best rate is 2.5% cash back from BeFrugal.com. Until better rates become available, I will keep using BeFrugal for the purchase of AmEx GCs. BeFrugal online portal is very reliable. 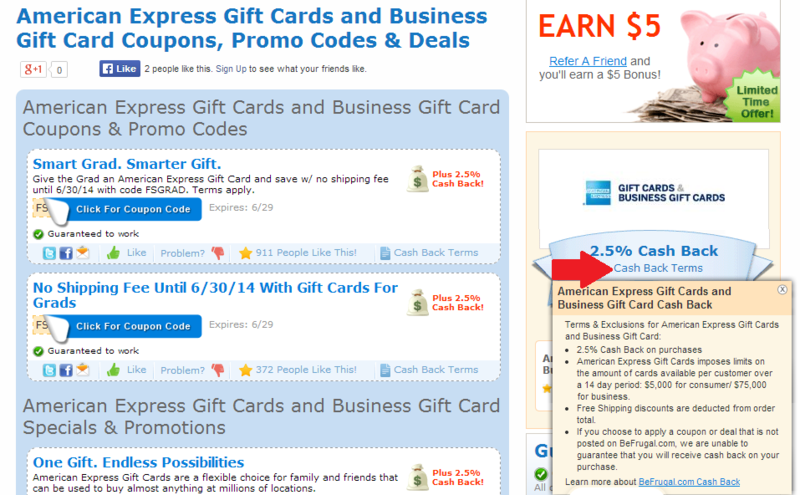 I had been using for other retailers, and it seems I will use for AmEx GCs for a while. I even respect for their showing cash back terms of each retailers very clearly. None of other portals bother to describe terms and conditions as detailed as BeFrugal does. How you use these sites is the same, type a name of retainers and click search and they show lists of available portals and rates. It is better to check on both sites. Because rates are constantly changing, and sometimes they can’t keep up with changes. They may show different rates, miss some portals, etc. In fact, as of today, I can’t find Befrugal on cashbackholic.com when I searched the rate for AmEx GC. On the other hand, you don’t see ShopDiscover on cashbackmonitor.com on the default search result. I hope the rate will go back to 4% or better soon.